This is tough to review considering it’s 3 separate novellas, so I’ll first discuss it as a whole then go into each story. Review in a Nutshell: Star-Touched Stories is a beautiful collection of novellas that will add so much to your overall enjoyment of this world and these characters. 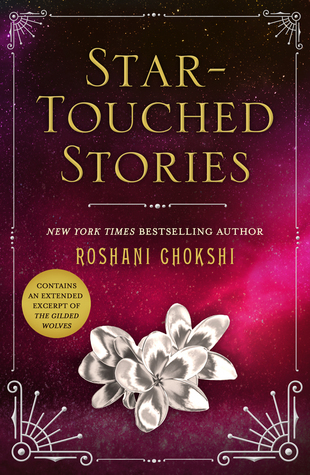 Star-Touched Stories includes 3 different novellas, each one around 100-115 pages. The first, Death & Night, takes place before the events of The Star-Touched Queen, and follows both Amar and Maya as they meet and fall in love for the first time. Poison and Gold takes place after the events of A Crown of Wishes, and follows Asha as she tries to earn her spot in Gauri and Vikrams court by becoming their Spy Mistress, but in order to do that she must earn the approval of the current Spy Mistress. Finally, Rose & Sword. I don’t want to describe this one too much, because it is something that is best going into knowing little. But let’s just say – it’s beautiful and heartbreaking and just so perfect. The world in The Star-Touched Queen series is always absolutely breathtaking, and this book is not an exception. From the Night Bazaar to the palace, this world is immensely beautiful and fascinating. The first novella really shows a lot of the aspects of this universe that I was dying to see during The Star-Touched Queen, and was everything I could have hoped for. Roshani Chokshi has such a gorgeous and elegant writing style. Each sentence is put together so perfectly that it just makes me want to smile. Her writing is flowery, but also has room for humor and wit when necessary, and never feels too pompous or pretentious. I was so happy to see all of these characters again. Honestly, this book adds so much to each of them. There were only a couple of characters that left me unimpressed, but for the most part, I would forget about them the second another character I loved arrived. Death & Night – 4.5 Stars – This novella was everything I needed. When I read The Star-Touched Queen, I really wanted something explaining the relationship between Maya and Amar from before she was reincarnated. While I enjoyed that book, that thought always hung over me, because I found their relationship hard to believe without the background. This novella is the background I was dying for, showing exactly how they came to be what they were. Poison & Gold – 3 Stars – This was definitely the weakest one for me. I enjoyed Aasha in A Crown of Wishes, but that wasn’t enough to make me love this story. I just found her love interest really lacking, which made me so sad because it was a sapphic love story and I was SO excited for that! Not to mention, the actual plot was less gripping in this one. However, I still did enjoy the writing and some smaller aspects. Rose & Sword – 5 Stars – I can’t tell you how hard I cried while reading this. For fans of A Crown of Wishes, this will destroy you. It was everything I didn’t even know I wanted and I don’t know what to do now that it’s over. It’s the perfect epilogue to a perfect story. Pros- beautiful writing, sapphic romance, also the other romances are adorable, and it just filled me with so much joy, okay? Cons- Aasha’s love interest was pretty weak, the second novella in general isn’t the greatest. Star-Touched Stories is absolutely necessary (and gorgeous) for anyone wanting more from this astonishing series.